Israel Adesanya & Derek Brunson is quickly becoming the people’s main event for whatever card the UFC decides to put them on. The UFC has to make this fight right? Last week, Derek and Israel birthed their beef with some social media barbs and even video. This week the two middleweights took their online feud into real life. They literally “met up in Temecula” except instead of arguing over Kobe Bryant’s place in NBA history, Brunson and Adesenya really just want to punch each other in the face. Also, we’re 99% sure this place is in Los Angeles. While sitting in the same LA bar for UFC 227 fight week, Israel Adesanya & Derek Brunson locked eyes across the room and they whipped out their phones for a candid video opportunity. 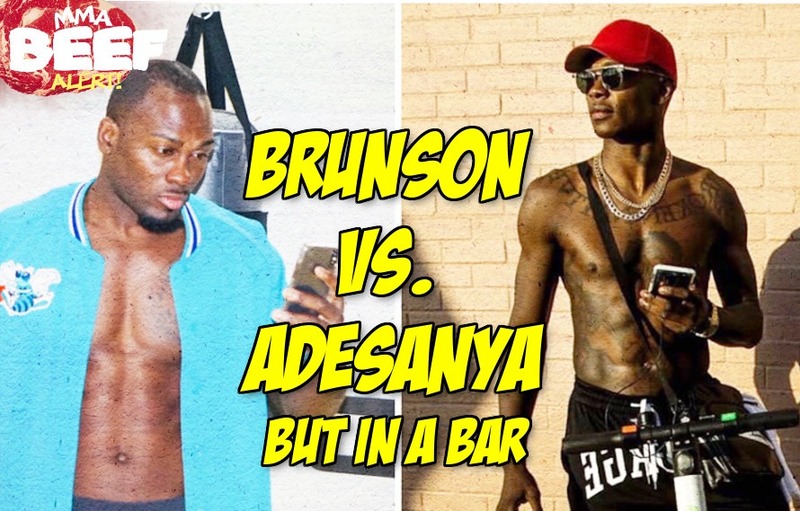 First up, Brunson spots his potential (long rumored) UFC 230 opponent across at the bar and starts talking all kinds of smack to Adesanya. This is great. We are here for all of this. Make the UFC’s middleweight division great again, thanks to top ten fighters barking at each other while drinking a Jack & Coke. Props to Derek and Israel for seizing the moment and making fans want this fight more than ever. Overall cheers to more UFC fighters confronting each other in public places for our entertainment. Crossing our fingers until the moment Derek and Israel run into each other at a California Wholes Foods organic produce section or some In-N-Out Burger drive-thru. Tony Ferguson Changes Management; Potential McGregor Bout Looming? How Much?! Proper 12 Whiskey Has Sold An Incredible Amount!! Founded in 2009, MiddleEasy.com provides UFC News daily MMA News, Fight Results, Street Fights, Weekly Rumors, Interviews, Analysis and complete coverage of the MMA sports. © Copyright 2018 MiddleEasy.com, All rights reserved.